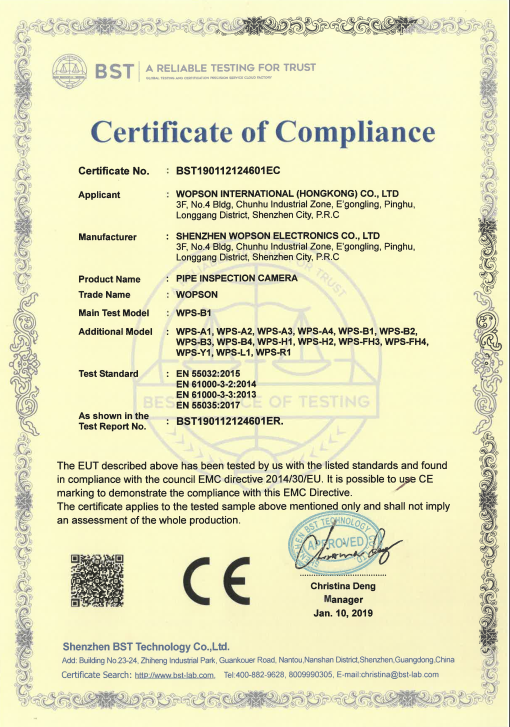 China Tilt Telescopic Pole Inspection Camera WPS-1510DSK supplier - high quality CCTV drain survey for sales, CCTV drain survey manufacturer. WPS-1510DSK is designed for the fast inspection and diagnosis of industrial tanks, vessels and pipes. The lightweight unit with its carbon fiber telescopic pole and sprung loaded stabilizing pole allows for easy single user operation. Ideal for pipe diameters from 100mm(4") to 1500mm (60"). The hi-vis vest houses the control box, MP5, with 4.3"screen and battery pack.The easy to operate camera with its LED lights guarantee a perfect view every time. Use the extended pole to increase the inspection depth, which can be extended40mmaximum. Precisely measure the object distance, with a precision of millimeter, which can help you position the pipe defects and provide exact distance for later engineering. Measuring distance 0.1-100m, typical precision ±1mm. Measuring frequency 20Hz, video overlay the measuring results.